Easily Defeats Active Noise Cancellation on Bose Stereo. Easy Plug and Play installation. Installs in seconds. 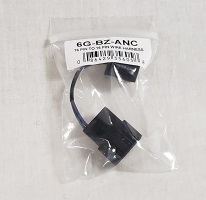 Highly recommended with our 6G-BZT Bose T-harness. No other important functions of the car are lost. ie: Bluetooth, OnStar, Chimes, Are All retained. usps domestic shipping included in price. Why it's needed.. Active Noise Cancellation aka ANC uses microphones hidden in the door panels to pick up in-cabin noise. The mics send this information to the amp, which in-turn sends offsetting signals out to all the speakers in the vehicle. This is a great technological feature until an aftermarket subwoofer is installed in the vehicle. The microphones begin to pick up the extra bass tones from the new subwoofer and proceed to pump the loud offsetting tones thru all the speakers and sub(s), resulting in a vicious cycle of obnoxious sound. Our in-line harness simply plugs into the x3 plug on the Bose amp (black connector 3rd one from the front). The wires for the microphones are deleted so that the microphones will essentially be deafeated and not functioning and thus will not hamper your subwoofer install. Works much better than trying to snip the microphone wires or attempting to locate and disconnect each mircrophone.